At last, an instant photo flip book for people who print photos at home! Ever searched for a simple, but impressive way to assemble and show off your precious photos? GBC has the answer. With these photo flip books, there's no need to upload photos, pick borders, add copy, etc. 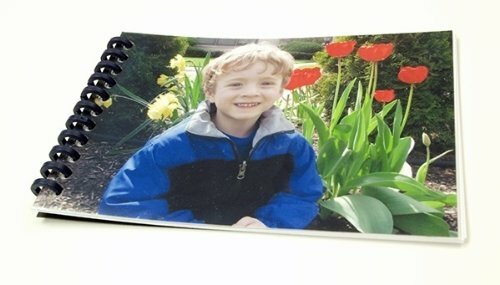 You just print your pictures at home and bind them with an attractive binder spine border, with no machine needed. There's no waiting to order prints from online or retail printers. Just print your favorite shots and snap the book together. Not sure what to give the grandparents for the holidays? There's no better gift than a beautiful bound presentation of family memories. Want to share the highlights of your latest travel adventure? 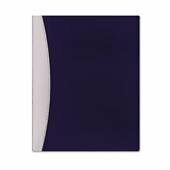 Print out your photos on the pre-punched photo paper, attach the photos, and front and back covers to the spine, and snap the spine closed. That's it - it's inexpensive, looks great, and lets you get the most from your photos. GBC laminating supplies are the perfect way to tailor your documents to match the occasion. With a full range of supplies for protecting and presenting your important information, GBC is the first choice for professionals everywhere. 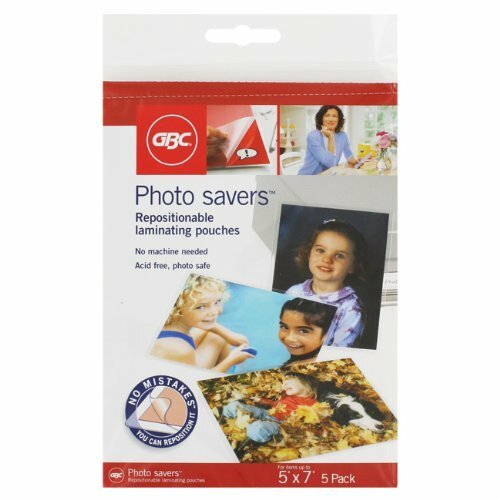 GBC Photo Savers Repositionable Laminating Pouches are a perfect way to quickly and easily protect your photographs without the need of a laminator. 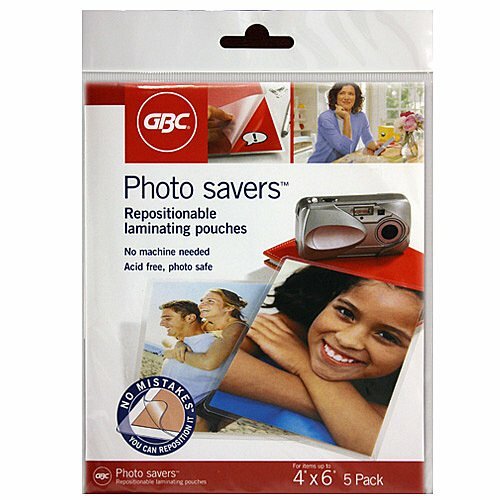 Repositionable Laminating pouches allow you to seal and reseal your documents until you get them perfectly smooth without any air bubbles. You can adjust the position of your laminate for up to 24 hours before the seal becomes permanent and protects your precious photograph with long-lasting protection. These Photo Savers are easy to use. No machine is required and the pouches are acid free, providing archival quality protection. For over 60 years, the GBC brand has been a world leader in products that help consumers present, protect, secure, organize and enhance their printed materials. GBC provides the right tools for today's professionals to successfully increase their efficiency and productivity. GBC NAP I Roll Film is designed to help you protect your most important documents, big or small. It's perfect for busy educators. 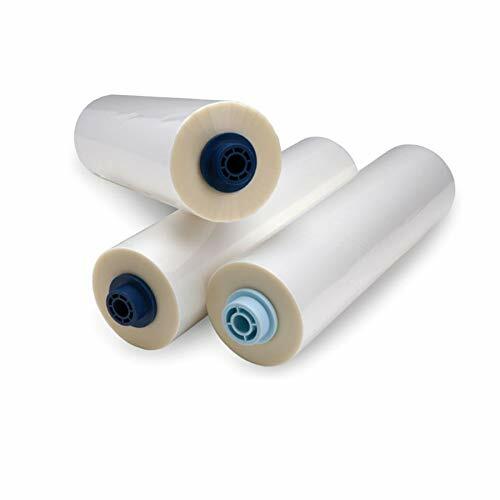 Load film into your laminator using patented, lightweight AutoGrip shafts or traditional steel shafts, which utilize thumb screws and core chucks. Keep your documents bright and bold. Glossy film has a shiny finish that helps emphasize colors, making it the perfect choice for photos, signs and posters. Choose the right film for your job. The 1.5 mil thickness provides protection while retaining flexibility. Each roll is 27" x 500' and is wound on a 1" core. Pack includes 2 rolls. NAP I film is the most common type of roll film and is ideal for everyday projects. It is compatible with most thermal roll laminators, including the GBC Ultima 65. It's the fastest, easiest way to laminate. Simply open the pouch and center your item face down on the clear side without the grid. Peel away the grid liner and firmly seal. Repositionable for up to 24 hours, provides long-term protection. Size: 5 in x 7 in. Color: Clear. Acid Free, photo safe. Includes 5 laminating pouches. 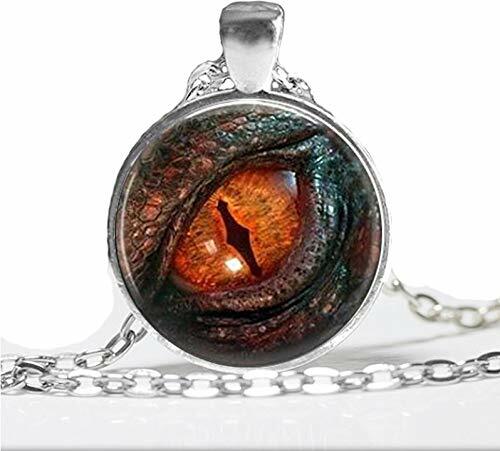 LoTR fans are sure to love this striking necklace remniscent of the dragon Smaug! Also similar to one of daenarys's dragons from GoT. This gorgeous necklace features a dragon eye image set in stainless steel! Great for gifting! Perfect for everyday wear! 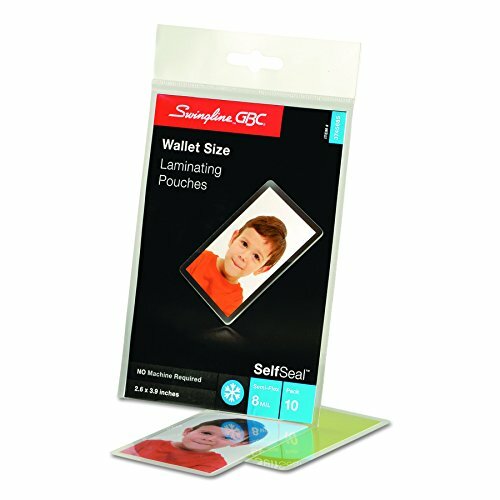 Protect your documents from wear and tear with GBC SelfSeal Laminating Pouches. These easy to use laminating pouches produce clear and crisp results for all of your everyday laminating needs. With a glossy and clear finish, your laminated items will stand out. Perfect for photos, certificates, and other home lamination projects. 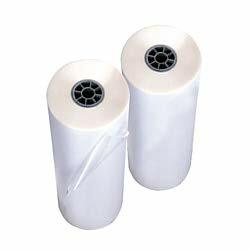 Cold laminating pouches are self-adhesive and do not require heat to create a lasting seal. Simply place your document inside the pouch and press down to close. The 8 mil thick pouches provide durable, semi-rigid protection. 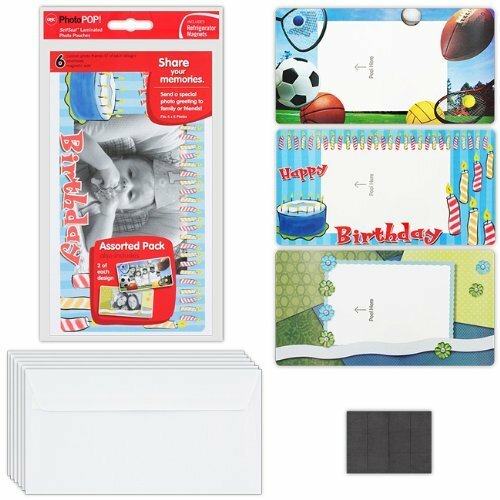 These 2-3/8" x 3-7/8" pouches are perfect for wallet sized documents. Pack includes 5 pouches. GBC Pinnacle 27 EZload Roll Film is designed to make laminating easier for busy educators by taking the guesswork out of film loading. EZload technology eliminates film loading errors. Color coded light blue and dark blue end caps show the correct way to load film, which avoids accidental upside down loading. Keep your documents bright and bold. Glossy film has a shiny finish that helps emphasize colors, making it the perfect choice for photos, signs and posters. Choose the right film for your job. The 1.5 mil thickness provides protection while retaining flexibility. Each roll is 25" x 500' and is wound on a 1" core. Pack includes 2 rolls. Compatible only with 2017 or earlier models of GBC Pinnacle 27 Thermal Laminators, which have blue saddles. NAP I film is the most common film and is great for everyday projects. Shopping Results for "Gbc Photo"